The Seleucid Empire ( /sɪˈljuːsɪd/ ;  Ancient Greek : Βασιλεία τῶν Σελευκιδῶν, Basileía tōn Seleukidōn) was a Hellenistic state ruled by the Seleucid dynasty which existed from 312 BC to 63 BC; Seleucus I Nicator founded it following the division of the Macedonian Empire vastly expanded by Alexander the Great. 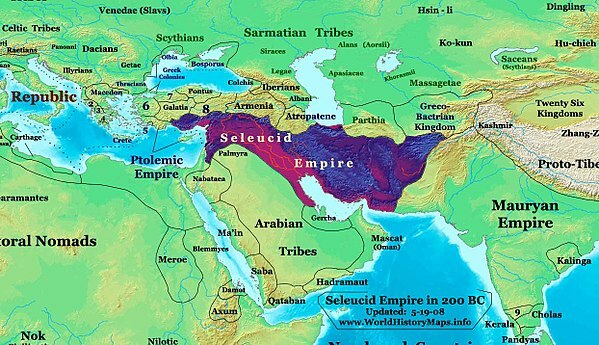 Seleucus received Babylonia (321 BC) and from there expanded his dominions to include much of Alexander's near-eastern territories. At the height of its power, the Empire included central Anatolia, Persia, the Levant, Mesopotamia, and what is now Kuwait, Afghanistan, and parts of Pakistan and Turkmenistan. 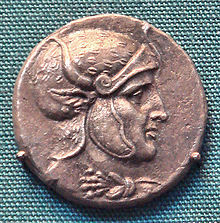 Seleucus I Nicator was one of the Diadochi. Having previously served as an infantry general under Alexander the Great, he eventually assumed the title of basileus and established the Seleucid Empire over much of the territory in the Near East which Alexander had conquered. The Partition of Triparadisus was a power-sharing agreement passed at Triparadisus in 321 BC between the generals (Diadochi) of Alexander the Great, in which they named a new regent and arranged the repartition of the satrapies of Alexander's empire among themselves. It followed and modified the Partition of Babylon made in 323 BC upon Alexander's death. The Seleucid Empire became a major center of Hellenistic culture – it maintained the preeminence of Greek customs where a Greek political elite dominated, mostly in the urban areas. The Greek population of the cities who formed the dominant elite were reinforced by immigration from Greece. Seleucid expansion into Anatolia and Greece halted abruptly in the early 2nd century BC after decisive defeats at the hands of the Roman army. Seleucid attempts to defeat their old enemy Ptolemaic Egypt were frustrated by Roman demands. 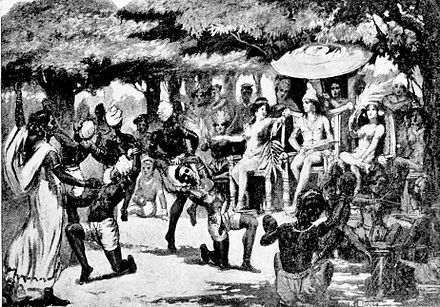 Having come into conflict in the East (305 BC) with Chandragupta Maurya of the Maurya Empire, Seleucus I entered into an agreement with Chandragupta whereby he ceded vast territory west of the Indus, including the Hindu Kush, modern-day Afghanistan, and the Balochistan province of Pakistan and offered his daughter in marriage to the Maurya Emperor to formalize the alliance. The Roman army was the terrestrial armed forces deployed by the Romans throughout the duration of Ancient Rome, from the Roman Kingdom to the Roman Republic and the Roman Empire, and its medieval continuation the Eastern Roman Empire. It is thus a term that may span approximately 2,206 years, during which the Roman armed forces underwent numerous permutations in composition, organisation, equipment and tactics, while conserving a core of lasting traditions..
Antiochus III the Great was a Hellenistic Greek king and the 6th ruler of the Seleucid Empire. He ruled over the region of Syria and large parts of the rest of western Asia towards the end of the 3rd century BC. Rising to the throne at the age of eighteen in 222 BC, his early campaigns against the Ptolemaic Kingdom were unsuccessful, but in the following years Antiochus gained several military victories and substantially expanded the empire's territory. His traditional designation, the Great, reflects an epithet he assumed. He also assumed the title Basileus Megas, the traditional title of the Persian kings. A militarily active ruler, Antiochus restored much of the territory of the Seleucid Empire, before suffering a serious setback, towards the end of his reign, in his war against Rome. Ilium or Ilion, also known as Troja (Τροΐα), was a city of ancient Epirus It is mentioned in the Aeneid of Virgil as a foundation of Helenus after the Trojan War in the land of the Chaonia. 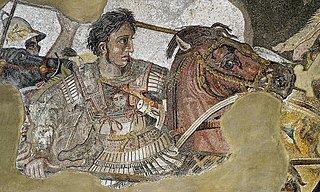 Lord of Asia was the title given to Alexander the Great after the Battle of Gaugamela in 331 BC. The title passed on to his successors after his death in Babylon in 323 BC, though none of them held any actual power in Asia or any other part of the Hellenistic Alexandrian Empire; the actual power fell to the numerous regents or the rebellious Persian satraps. With the partition of his empire and the rise of the Diadochi, the title of Lord of Asia fell in abeyance. Antigonus, son of Menophilus was a Seleucid official (nauarchos). He served under king Alexander, in the mid-2nd century BC. He is known from an inscription found in the city of Miletus. Alexander I Theopator Euergetes, surnamed Balas, was the ruler of the Greek Seleucid kingdom in 150/Summer 152 – August 146 BC. Alexander defeated Demetrius Soter for the crown in 150 BC. Ruling briefly, he lost the crown to Demetrius II Nicator during his defeat at the Battle of Antioch in Syria, dying shortly after. The Achaemenid Empire, also called the First Persian Empire, was an empire based in Western Asia founded by Cyrus the Great. 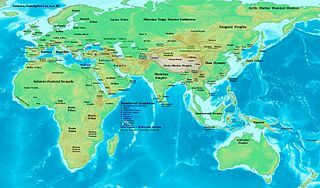 Ranging at its greatest extent from the Balkans and Eastern Europe proper in the west to the Indus Valley in the east, it was larger than any previous empire in history, spanning 5.5 million square kilometers. Incorporating various peoples of different origins and faiths, it is notable for its successful model of a centralised, bureaucratic administration, for building infrastructure such as road systems and a postal system, the use of an official language across its territories, and the development of civil services and a large professional army. The empire's successes inspired similar systems in later empires. Darius III, originally named Artashata and called Codomannus by the Greeks, was the last king of the Achaemenid Empire of Persia, from 336 BC to 330 BC. Artashata adopted Darius as a dynastic name. Antiochus I (reigned 281–261 BC) and his son and successor Antiochus II Theos (reigned 261–246 BC) were faced with challenges in the west, including repeated wars with Ptolemy II and a Celtic invasion of Asia Minor —distracting attention from holding the eastern portions of the Empire together. Towards the end of Antiochus II's reign, various provinces simultaneously asserted their independence, such as Bactria and Sogdiana under Diodotus, Cappadocia under Ariarathes III, and Parthia under Andragoras. A few years later, the latter was defeated and killed by the invading Parni of Arsaces – the region would then become the core of the Parthian Empire. The latter part of his reign saw a further disintegration of the Empire despite his best efforts. Weakened economically, militarily and by loss of prestige, the Empire became vulnerable to rebels in the eastern areas of the empire, who began to further undermine the empire while the Parthians moved into the power vacuum to take over the old Persian lands. Antiochus' aggressive Hellenizing (or de-Judaizing) activities provoked a full scale armed rebellion in Judea —the Maccabean Revolt. Efforts to deal with both the Parthians and the Jews as well as retain control of the provinces at the same time proved beyond the weakened empire's power. Antiochus died during a military expedition against the Parthians in 164 BC. This article concerns the period 129 BC – 120 BC. During the 290s BC, Hellenistic civilization begins its emergence throughout the successor states of the former Argead Macedonian Empire of Alexander the Great, resulting in the diffusion of Greek culture throughout the Levant and advances in science, mathematics, philosophy, etc. Meanwhile, the Roman Republic is embroiled in war against the Samnites, the Mauryan Empire continues to thrive in Ancient India, and the Kingdom of Qin in Ancient China, the one which in the future will conquer its adversaries and unite China, begins to emerge as a significant power during the Warring States period. This article concerns the period 179 BC – 170 BC. Demetrius II, called Nicator, was one of the sons of Demetrius I Soter possibly by Laodice V, as was his brother Antiochus VII Sidetes. He ruled the Seleucid Empire for two periods, separated by a number of years of captivity in Hyrcania in Parthia: first from September 145 BC to July/August 138 BC and again from 129 BC until his death in 125 BC. His brother Antiochus VII ruled the Seleucid Empire in the interim between his two reigns. Demetrius III Theos Philopator Soter Philometor Euergetes Callinicus was a Hellenistic Seleucid monarch who reigned as the King of Syria between 96 and 87 BC. He was a son of Antiochus VIII and, most likely, his Egyptian wife Tryphaena. Demetrius III's early life was spent in a period of civil war between his father and his uncle Antiochus IX, which ended with the assassination of Antiochus VIII in 96 BC. After the death of their father, Demetrius III took control of Damascus while his brother Seleucus VI prepared for war against Antiochus IX, who occupied the Syrian capital Antioch. Antiochus I Soter, was a king of the Hellenic Seleucid Empire. He succeeded his father Seleucus I Nicator in 281 BC and reigned until his death on 2 June 261 BC. Antiochus II Theos was a Greek king of the Hellenistic Seleucid Empire who reigned from 261 to 246 BC. He succeeded his father Antiochus I Soter in the winter of 262–61 BC. He was the younger son of Antiochus I and princess Stratonice, the daughter of Demetrius Poliorcetes. Seleucus II Callinicus Pogon, was a ruler of the Hellenistic Seleucid Empire, who reigned from 246 BC to 225 BC. Faced with multiple enemies on various fronts, and not always successful militarily, his reign was a time of great turmoil and fragmentation for the Seleucid empire, before its eventual restoration under his second son and eventual successor, Antiochus III. Diodotus Tryphon was a king of the Hellenistic Seleucid Empire who initially acted as regent and tutor for the son of Alexander Balas, but soon declared himself king in 142 BC after the death of his charge, Antiochus VI Dionysus, and reigned until his own death in 138 BC. 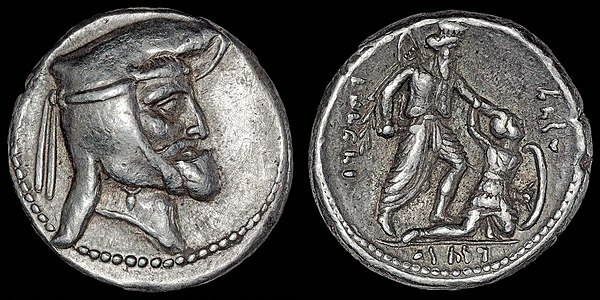 Diodotus I Soter was Seleucid satrap of Bactria, rebelled against Seleucid rule soon after the death of Antiochus II in c. 255 or 246 BC, and wrested independence for his territory, the Greco-Bactrian Kingdom. He died in 239 BC. Demetrius I, also called Dharmamita, was a Hellenistic king of Gandhara. He was the son of the Greco-Bactrian ruler Euthydemus I and succeeded him around 200 BC, after which he conquered extensive areas in what is now Afghanistan and Pakistan. The Seleucid king Seleucus V Philometor, ruler of the Hellenistic Seleucid kingdom, was the eldest son of Demetrius II Nicator and Cleopatra Thea. The epithet Philometor means "mother-loving" and in the Hellenistic world usually indicated that the mother acted as co-regent for the prince. Laodice I was a Greek noblewoman of Anatolia who was a close relative of the early Seleucid dynasty and was the first wife of the Seleucid Greek King Antiochus II Theos. The Greco-Bactrian Kingdom was – along with the Indo-Greek Kingdom – the easternmost part of the Hellenistic world, covering Bactria and Sogdiana in Central Asia from 250 to 125 BC. It was centered on the north of present-day Afghanistan. The expansion of the Greco-Bactrians into present-day eastern Afghanistan and Pakistan from 180 BC established the Indo-Greek Kingdom, which was to last until around 10 AD. The Seleucid Dynastic Wars were a series of wars of succession that were fought between competing branches of the Seleucid Royal household for control of the Seleucid Empire. 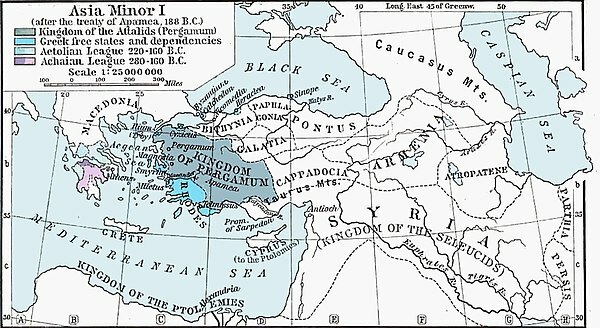 Beginning as a by-product of several succession crises that arose from the reigns of Seleucus IV Philopator and his brother Antiochus IV Epiphanes in the 170s and 160s, the wars typified the final years of the empire and were an important cause of its decline as a major power in the Near East and Hellenistic world. The last war ended with the collapse of the kingdom and its annexation by the Romans in 63 BC. 1 2 3 4 5 Taagepera, Rein (1979). "Size and Duration of Empires: Growth-Decline Curves, 600 B.C. to 600 A.D.". Social Science History. 3 (3/4): 121. doi:10.2307/1170959. JSTOR 1170959. ↑ Nigel Wilson (2013). Encyclopedia of Ancient Greece. p. 652. ISBN 9781136788000. ↑ Paul J. Kosmin (2014). The Land of the Elephant Kings. p. 112. ISBN 9780674728820. ↑ Tarn, W. W. (1940). "Two Notes on Seleucid History: 1. Seleucus' 500 Elephants, 2. Tarmita". Journal of Hellenic Studies . 60: 84–94. doi:10.2307/626263. JSTOR 626263. 1 2 3 Engels, David. Iranian Identity and Seleucid Allegiance; Vahbarz, the Frataraka and Early Arsacid Coinage, in: K. Erickson (ed. ), The Seleukid Empire, 281-222 BC. War within the Family, Swansea, 2018, 173-196. 1 2 Erickson, Kyle (2018). The Seleukid Empire 281-222 BC: War Within the Family. ISD LLC. p. 175. ISBN 9781910589953. 1 2 Images of the known coins of this type in KINGS OF PERSIS, Orbozos. 3rd Century BC. Silver Drachm. One of just two known specimens. From The Sunrise Collection. ↑ Kosmin, Paul J. (2018). Time and Its Adversaries in the Seleucid Empire. Harvard University Press. p. 207. ISBN 9780674976931. ↑ Erickson, Kyle (2018). The Seleukid Empire 281-222 BC: War Within the Family. ISD LLC. p. 175. ISBN 9781910589953.